Feeding peachicks the correct food is important to ensure you have strong healthy peachicks, which will grow into strong healthy peafowl. Adopting the correct feeding routine is essential. In the wild peachicks learn to forage for food aged 3-4 days, eating insects and small animals plus seeds, grains and berries. When peachicks hatch they can go without food for 24 – 48 hours as the absorb the yolk sack. In captivity peachicks should be fed medicated game crumb up to six to eight weeks. After this the peachicks move onto Game Grower One feed. At around 12 weeks, the peachicks feeding routine moves onto Game Grower Two. Peachicks also like crumbed hard boiled eggs, kitten food or cheese and kitchen scraps. 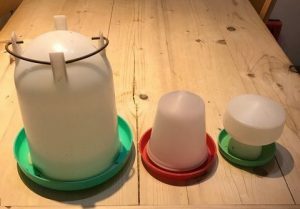 The peachick food should be kept in a covered specialist bird feeding containers. This will prevent contamination from peachick faeces which could cause disease or infection. The food also needs to be kept dry and should be available on demand for the peachicks when they want it. Fresh water should always be available for both adult peafowl and peachicks. Peachicks should be fed water from covered containers so that the chance of drowning is minimised. As the peachicks grow the size of the water containers should be changed for a larger size as demand increases.